In case you have not been following the Hunger Games movie casting news closely, you might not have heard that Lenny Kravitz was announced to be playing Cinna, Katniss’s stylist. A lot of people have been reacting with surprise/negativity. I’m definitely disappointed, but only because I really wanted Christian Siriano (from Project Runway) to play Cinna. Christian Siriano. He looks slightly different from Lenny Kravitz. Obvi, Christian Siriano is not an actor, and I have no idea whether or not he’d be any good as Cinna. And his persona is much more manic than the calm Cinna. Cinna is actually probably more like Tim Gunn. But a long time ago someone put the idea in my head that Christian Siriano should play Cinna, and I ran with it in my head. And I think that, based on his work on Project Runway, Christian could totally design an awesome outfit for Katniss, and I would in fact love for that to be a Project Runway challenge. Lenny Kravitz does strike me as an odd choice. He’s not an actor, either–though apparently he had a role in Precious, which I have not seen. But, like, honestly I don’t care that much. I’ll definitely see the movie no matter who they put in it.I also think it’s a positive to have another person of color in the cast–I don’t remember if Cinna was described as being black, and I don’t really care if he wasn’t. I totally missed that Rue was described as being black, but I’m glad they’ve cast an actress of color for her part. I’m not sure what it is about my imagination, but when I read a book I hardly ever have a clear mental image of what the characters look like, which is fine. I have a better idea of what they sound like and what they feel like. Whenever a book comes out as a movie, the movie actors instantly take over in my mind as what the character looks like. I do notice occasional things–like I know Harry Potter has green eyes, which J. K. Rowling mentioned, oh, seven thousand times, and which Daniel Radcliffe does not have. But, honestly, not the biggest deal to me. If they’d cast a sassy Latina as Harry Potter (for example), I would be intrigued, but might not have been on board with it. But I think Daniel Radcliffe did a fine job as Harry, and he is now my mental image of the character, green eyes or no. Cool. So now that is how Katniss looks in my head, and that’s fine. 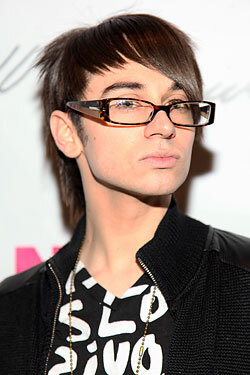 Until I see the movie, though, Cinna will probably still look like Christian Siriano. So, rock on, Cinna. Rock on. Oh Peeta. Sweet, unwaveringly loyal, smart and cute… what else does a girl need? Well if you’re Katniss Everdeen, you could go for the best friend, the one you’ve known all your life – the one that looks so much like you he could be your brother (AKA Gale)! But you should go for the one that risks his life for yours over and over and over again. The one who when you kiss, even though you tell y0urself you’re just pretending, it makes you week in the knees. The one who doesn’t keep secrets from you for your own good. Even at the beginning of the series, there was something about Gale that just didn’t sit right. What was he waiting for? Did he just think of Katniss as a kid sister or something more? When we are introduced to Peeta, Katniss tells the reader about how he gave her some bread, even though he knew it would lead to a beating from his evil mother. So even before they were put in the arena, Peeta was risking himself for Katniss. And then in Mockingjay when he is brainwashed into hating her, he comes around and still loves her. And meanwhile, Gale because war obsessed and loses his compassion for humanity in exchange for the “greater good”. There is no way that Katniss would ever love Gale after the decisions he made and murders that he put into place. Peeta is the only one that was in the arena with Katniss both times and the only one that truly understands. PS – I agree with Renata though, what she really needs is a good therapist and a white padded room for awhile. Friday Feud: Gale vs Peeta! Sandy and I decided to try out a new feature called FRIDAY FEUD. Gotta get down (with YA literature) on Friday. Our first feud comes from Suzanne Collins’ Hunger Games trilogy. Which, if you haven’t read it yet, you’re probably a really boring person. I just don’t know how else to say it. In case you haven’t read it, I will warn you that this post is full of SPOILERS FOR THE WHOLE TRILOGY! But if you want to read on anyway, a quick intro: the Hunger Games books are set in a weird dystopia where every year, each district is required to send two children to fight to the death against children from other districts. It serves both as reality entertainment–the games are broadcast and are the most popular show on the air–and as a way to keep the people scared and under control. Our heroine, Katniss Everdeen volunteers to take her younger sister’s place in the Games. She’s accompanied by Peeta Mellarck, the relatively well-off baker’s son who she doesn’t know very well. Katniss is well-prepared for the games, having grown up illegally hunting in the woods with her late father and her best friend, Gale Hawthorne. Gale is rough and manly and woodsy! Peeta is gentle and shy and artistic! And they are both so totally in love with Katniss. And Katniss, well, she is basically over it. She just wants to save her sister and have people leave her the eff alone. 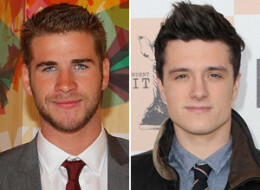 So, Team Gale or Team Peeta? I think Team Peeta is more popular–at least, among people I know. And, of course, Mockingjay ends with Katniss and Peeta together. I don’t have strong feelings either way, honestly. I like the Hunger Games trilogy for its political intrigue, and not so much for the romance. And if you ask me, Katniss doesn’t need a boyfriend, she needs a therapist. But for the sake of FRIDAY FEUD I will stick up for Gale. It took five, ten, fifteen years for me to agree [to have children]. But Peeta wanted them so badly. When I first felt her stirring inside of me, I was consumed with a terror that felt as old as life itself. Only the joy of holding her in my arms could tame it. Carrying him was a little easier, but not much. What? Come on, Peeta, Katniss should not have kids. Homegirl is too traumatized for that business. You should know better. Gale wouldn’t pull that. Opposites may attract, but lasting relationships tend to be built on similarities. Katniss and Gale could have had a good thing.